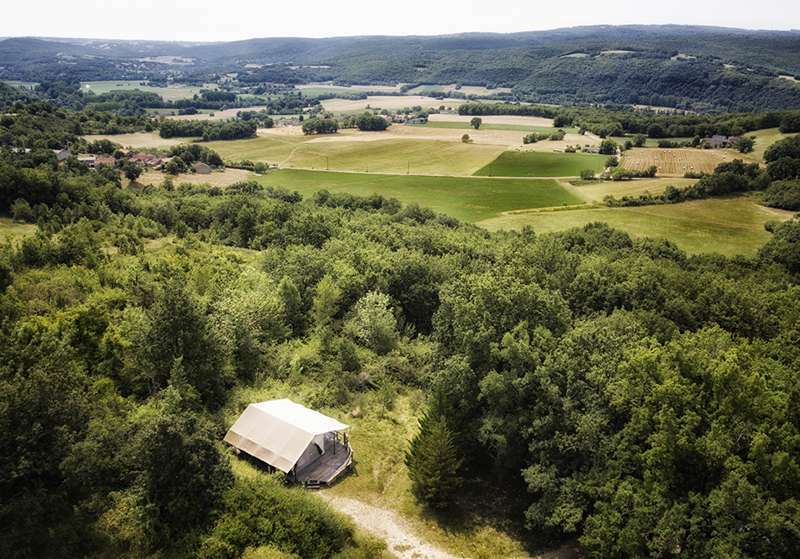 Luxury penthouse safari tent, situated on it's own private plateau at the very top of Le Camp with fantastic views across the Aveyron Valley. Mount Kenya has it's own fully equipped outdoor kitchen, en-suite safari shower and toilet. 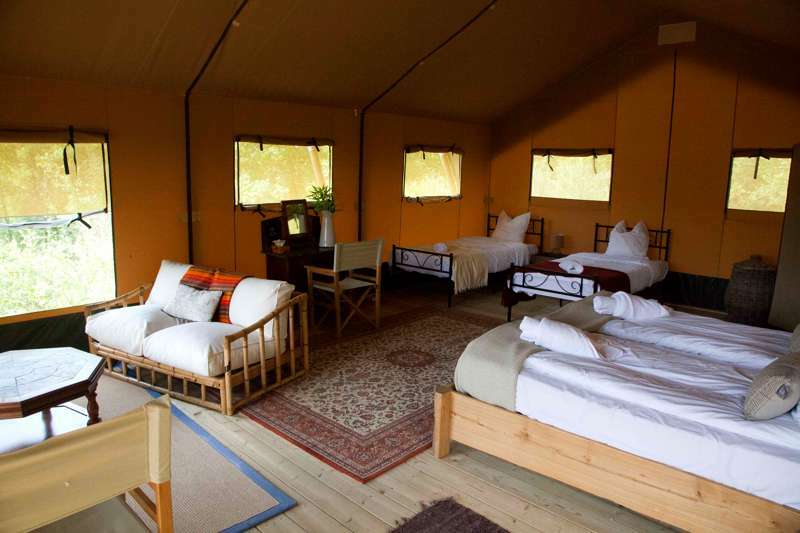 There is extra sleeping space in a kids safari tent. 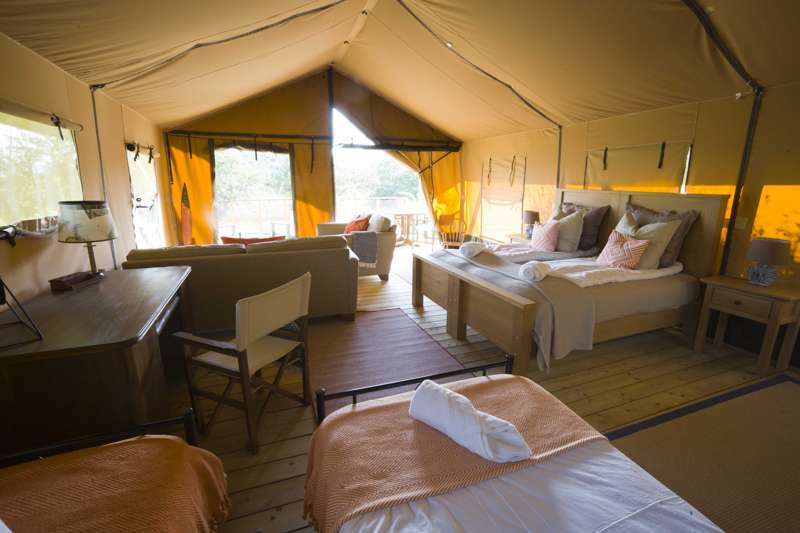 The ultimate luxury camping experience and a taste of Africa. 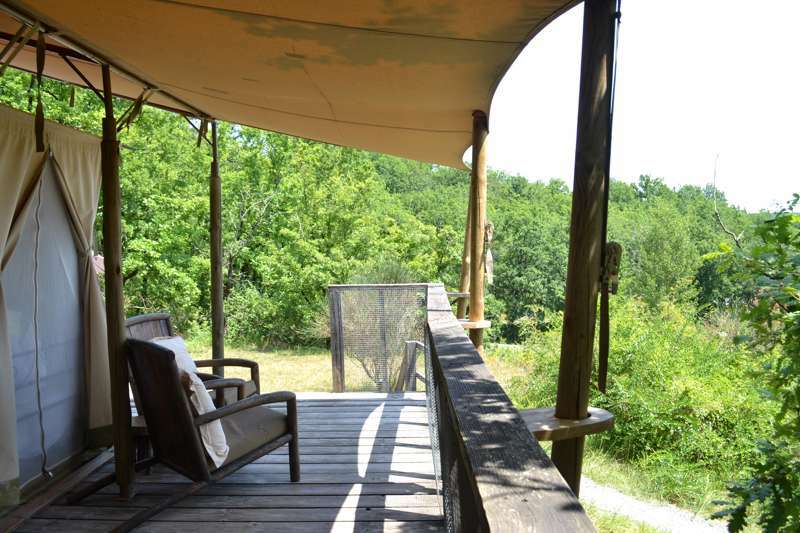 Safari tent with large outdoor veranda. Luxurious and extremely spacious, Tsavo East can sleep 2 adults and up to 3 children. With a very secluded spot with spectacular views and close access to the Woodland Spa showerhouse, Tsavo East is ideal for those looking to get away in luxury. 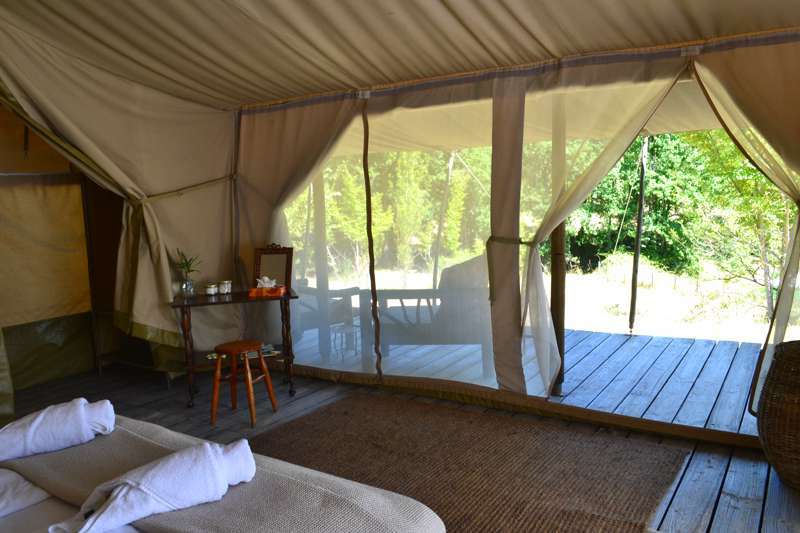 Le Camp offers luxury camping, or glamping if you prefer! It is a unique holiday experience. Here you will discover the thrill and adventure of sleeping under canvas without the discomfort of traditional camping. We offer the luxury of a hotel and the self-sufficiency of a private villa. 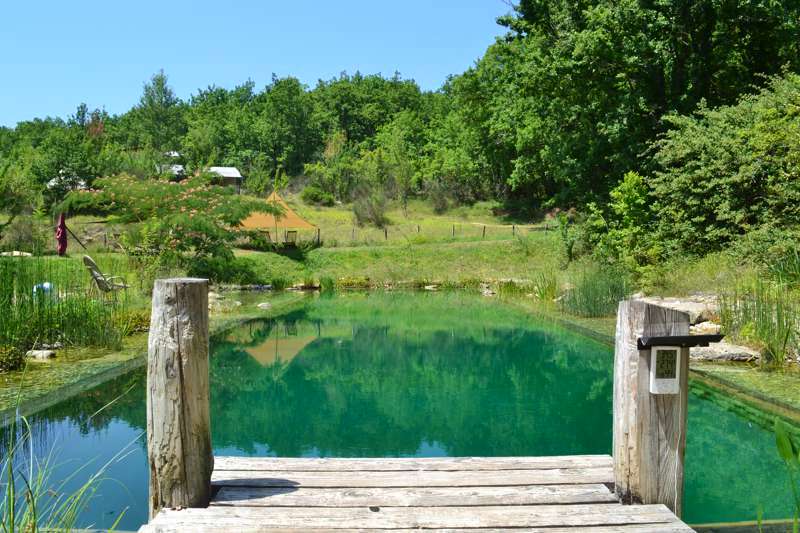 Set deep in the countryside of South West France, a little off the beaten track, at Le Camp you will find peace and tranquility amongst the trees. Encounter nature in style in your own private hideaway. For latest availability and best prices for Le Camp, please use the Date Search above. The Midi-Pyrénées region is home to over a dozen villages (officially listed as ‘Les Plus Beaux Villages de France’). This is more than almost any other region in the country. There are over 1,000 climbing routes around the Gorges de l’Aveyron and the landscape is criss-crossed by way-marked walks. Head to the nearby St-Antonin-Noble-Val to enjoy a spot of kayaking, hiring your boat for the day from Location Canoe/Les Pieds dans l’Eau (0033 563 68 24 80). Alternatively, buy a fishing licence from a local newsagent and do some angling for trout from one of the area’s many bridges. Further afield, the Forêt de la Grésigne offers the chance to experience the largest oak forest in Europe. If it rains, take a short drive to the UNESCO World Heritage town of Albi and check out its Toulouse-Lautrec museum (0033 563 49 48 70). In the nearby medieval town of St Antonin Noble Val, characterful La Corniche (0033 563 68 26 95) is exellent and the views are knock-out. Or seek out the riverside Manjocarn Café (0033 563 68 25 85), hang out of choice for all the local climbers and so laid back its unbelievable, with great locally sourced and produced food. Le Camp is situated in South West France, an hour and a half's drive from the airports of Toulouse and Rodez or a 9–10 hour drive from Calais. Follow directions, which are sent when you book. 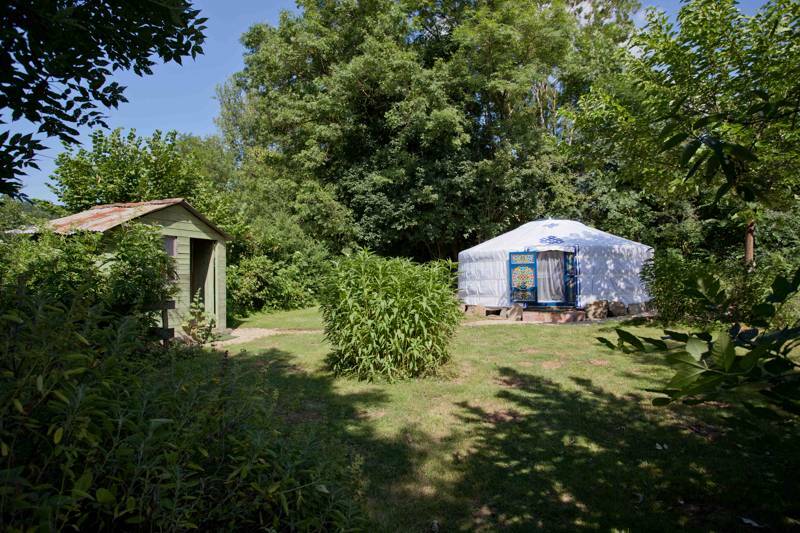 5 safari tents and 2 woodland yurts.